KUALA LUMPUR: Standard Chartered Saadiq Bhd (Saadiq) is on the right track to being a digital bank with a human touch, with nearly half of all its’ clients embracing digital services for their banking needs. Of Saadiq’s total client base, 45 per cent use digital banking; and of these, 90 per cent of their transactions are done digitally, via online or mobile banking, self-service ATMs and branch Straight-Through-Processing, or branch automation. Chief executive officer Ali Allawala said the 45 per cent adoption rate by Saadiq clients is very encouraging. “This is because the latest World Islamic Banking Competitiveness report by Ernst & Young showed that Islamic banking users have typically lagged behind conventional banking users when it comes to adopting digitalisation,” he said. According to the report, 38 per cent of conventional banking users surveyed used digital banking, in contrast to only 26 per cent of Islamic banking users. 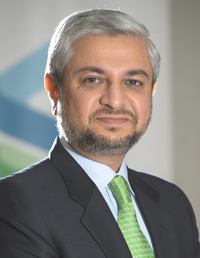 This is indicative of the way Standard Chartered Saadiq has embraced technology to make banking simpler, faster and better for Saadiq’s clients, Ali said, adding that the bank’s commitment towards being an agile, digital bank has also won Saadiq the honour of being named ‘Global Finance’s Best Islamic Digital Bank – Malaysia’ 2018 recently. “Saadiq clients can perform a wide range of services and transactions without ever needing to walk into a physical branch. From balance enquiries and balance transfers, to changing their address or contact information – everything can be performed online via a digital channel,” Ali said. Standard Chartered is also the first bank in Malaysia to offer a complete range of banking transactions via its mobile app, once the client has authenticated their credentials via Touch ID. “We are also the first bank to enable Live Bank video banking for online banking. To become a next generation digital bank, we must start with meeting the needs of the next generation of clients,” Ali added. Aside from Malaysia, Standard Chartered was also named Best Islamic Digital Bank in Pakistan and Bangladesh. The Global Finance win brings the total awards tally for the global Saadiq franchise to 35 since the start of 2018.